Hamas authorities in the Gaza Strip executed two Palestinians convicted of collaborating with Israel, according to a Palestinian human rights group. The two men, who were not identified by name, were shot by a firing squad overnight, Jamil Serhan, a board member of the Al Mezan Center for Human Rights in Gaza, said today in a telephone interview. Two bodies with gunshot wounds were received at Gaza’s Shifa Hospital, said Mo’aweya Hassanein, head of the emergency department at the Palestinian Health Ministry in Gaza, BusinessWeek reports. Human rights organizations have long been demanding that the death penalty be abolished in the West Bank and Gaza Strip. It’s not known how many Palestinians have been sentenced to death by Hamas courts in the Gaza Strip for allegedly serving as informants for Israel. 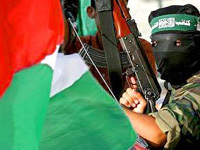 In the past year, Hamas authorities announced that they have managed to uncover dozens of “collaborators” in the Gaza Strip, some of whom had been directly and indirectly responsible for the killing of Palestinian gunmen and civilians, Jerusalem Post says.